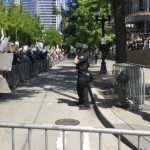 The anti-Sharia protest and its counter-protest in downtown Seattle on Saturday was a face-off of a smaller group of anti-Sharia protestors and a colorful and loud, larger group of counter-protesters. Between the two groups was a zone of about 50 feet lined with rows of police. It was a noisy affair with counter-protestors blaring horns and the sound of a train whistle. Listen to our series on what Sharia is, as shared by the people who attend the protest and counter-protest. episiode 1 – KBCS reporter, Andrew Perry interviewed people on the anti-sharia side of the scene and then posed the topics to Lawyer and Muslim Association of Puget Sound member, Aneelah Afzali. Afzali had organized a booth with a sign “Ask A Muslim”. It was positioned directly across from the anti-Sharia protestors with others in the interfaith community as a resource to answer questions anyone might have about Islam or about Muslim culture. episode 2 – University of Washington Director of Islamic Legal Studies and Professor of Law, Dr. Clark Lombardi explains what Sharia is.